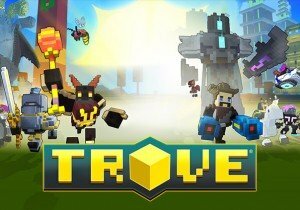 Dragons, badges, and challenges are coming to Trove. The first available dragon to players is the Azulian Dragon. Earned first as a dragonling pet, players must collect Azulian Dragon Souls by completing challenges to raise it to a fledgling status, useable as amount, and then a dragon, useable as a flying mount! Truly dedicated players can unlock the legendary Azorian the Blue, which can also use fire breath to decimate your foes. Challenges happen hourly and run for twenty minutes, giving players the chance to earn Dragon Caches by completing tasks in a set time. Badges are earnable pieces of flair for completing achievements in Trove. More info on these systems is available here.